Where do I begin? 7 years ago, I bought myself a 2005 Harley-Davidson® Dyna® Super Glide® Sport and rode her home over 2 days. When I bought her, I knew I had a gem, but by the time I got home I knew that I had found a diamond! As one does with Harleys, I changed the front end to suit my riding style, so I widened the triple trees, braced the forks and had a custom drag bar made up for me. Needless to say the change was radical and transformed her from a rough diamond to a polished piece of motorcycle art. This bike became a part of our family and even featured prominently in our wedding photographs. She took me all over the country and became the first bike my wife ever rode on too. My son loved her and all was well. Sadly, as life does, we were dealt a tough hand and I had to part with her.Selling this bike was the toughest thing I had done as she was more than just a bike. She was OUR bike. Fortunately she went to a very good friend of mine who took care of her for me. He rode her for a while and then after 2 years of separation I managed to get her back from him after much haggling and negotiation. 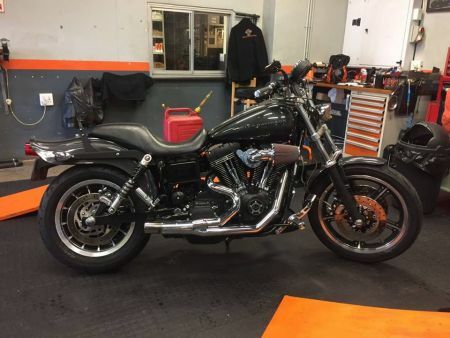 The first thing I did was bring her to our Master Technician at Harley-Davidson® Durban and he proceeded to rip her motor apart to check on her overall health. We found some issues and thus began the re-birth of the legend. We proceeded to rebuild the entire engine right down to the very last nut and bolt. We fitted Screamin’ Eagle® pistons, cams, stroker crank, bearings, oil pump to name but a few parts. Our Master Technician spent hours honing every part of the engine and when it came to assembly time a new legend was born. My forever bike had been given a new breath of life, stronger and more powerful than ever before! I have just finished running her in and I am happy to report that not only does she look amazing, she sounds incredible too. Acceleration is instant and when you really roll it on the roar of the heavily modified exhaust is nothing short of mind blowing! I am forever grateful to Harley-Davidson® Durban and the workshop team for the love and care that was put into helping me resurrect my bike.